We did a little research on the Street Feast London website, and the first place we wanted to try was Vinn Goute. Even though New York is a melting pot, with people from all over the world, one thing you will not find is a street vendor from the Seychelles, an island chain in the Indian Ocean. We’re not sure if there is even a restaurant in NYC serving food from the Seychelles, but that’s where Vinn Goute is from. Being an island chain, the cuisine is seafood-oriented, which we love. There was Exotic (whole) Fish, Halal Goat Curry and assorted appetizers. 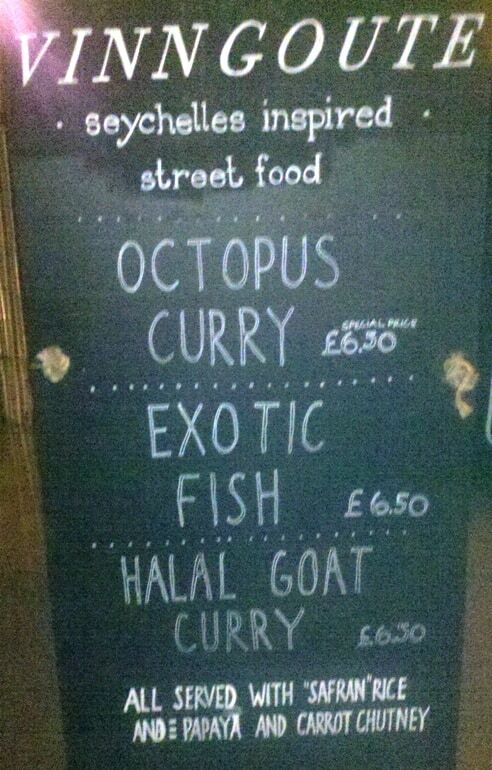 Octopus coconut curry was at the top of their blackboard menu, and at the top of our list as well. It cost £6.50 (about $10). The dish was enough for dinner, and was served over thin basmati rice. There was a nice shredded cabbage salad on the side. The octopus coconut curry was a stew, with plenty of pieces of octopus in the dish. Anyone who likes octopus knows it can be tough and chewy if not made properly. This was probably the most tender octopus we’ve ever had. Yum! The brown curry sauce was spicy, just as we like it. The heat was a slow build though, not immediately in your face. Scooped up with the rice, it was delicious. In terms of similarity, this curried stew could have been from one of the Caribbean islands, which makes sense, with the Seychelles being an island country. We didn’t really taste any coconut, but there was plenty of curry flavor. The salad was nice on the side, with a light vinegar sauce. It was similar to cole slaw, but very finely shredded. That stewed whole fish in sauce looked delicious too. No we need another excuse to go back to London. If you go to London (or happen to live there), definitely look up Vinn Goute. Their twitter account is here, facebook is here, and their website is here.